This section covers storing guest virtual machines in a directory on the host physical machine. 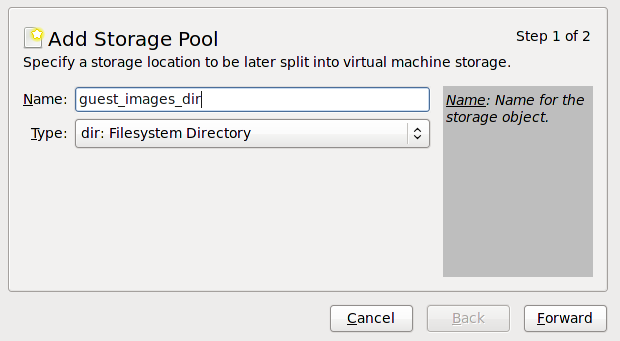 Directory-based storage pools can be created with virt-manager or the virsh command line tools. 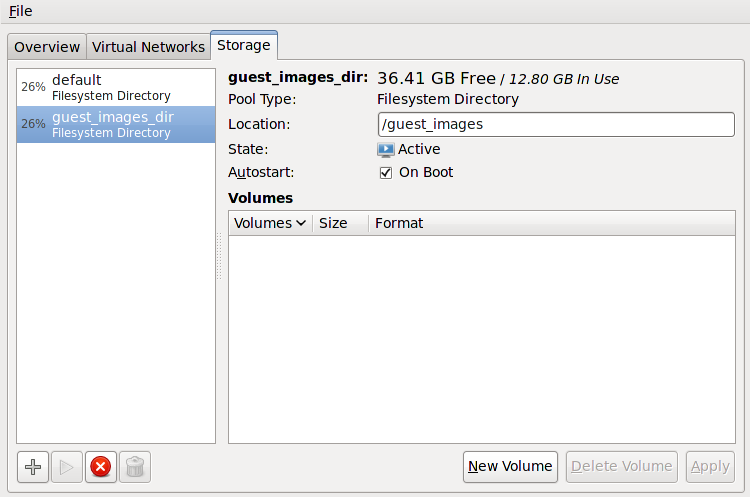 Create the directory on the host physical machine for the storage pool. This example uses a directory named /guest virtual machine_images. Change the user and group ownership of the directory. The directory must be owned by the root user. Change the file permissions of the directory. Verify the permissions were modified. The output shows a correctly configured empty directory. Configure the correct SELinux context for the new directory. Note that the name of the pool and the directory do not have to match. However, when you shutdown the guest virtual machine, libvirt has to set the context back to a default value. The context of the directory determines what this default value is. It is worth explicitly labeling the directory virt_image_t, so that when the guest virtual machine is shutdown, the images get labeled 'virt_image_t' and are thus isolated from other processes running on the host physical machine. In the virt-manager graphical interface, select the host physical machine from the main window. Click on the Storage tab of the Connection Details window. Choose a Name for the storage pool. This example uses the name guest_images. Change the Type to dir: Filesystem Directory. Press the Forward button to continue. Change the Target Path field. For example, /guest_images. Verify the details and press the Finish button to create the storage pool. The new storage pool appears in the storage list on the left after a few seconds. Verify the size is reported as expected, 36.41 GB Free in this example. Verify the State field reports the new storage pool as Active. Select the storage pool. In the Autostart field, confirm that the On Boot check box is checked. This will make sure the storage pool starts whenever the libvirtd service starts. The storage pool is now created, close the Connection Details window.